It was 1955 when, at the age of 33, Kripaluji Maharj organized his first religious conference in Chitakroot, which was attended by prominent spiritual leaders from across India. Among the many attendees was Mahamahopadhyay Giridar Sharma, president of the Kashi Vidvat Parishad, who was greatly impressed with the Shri Maharajji’s learning and knowledge of scripture. 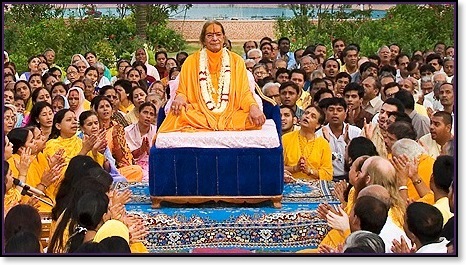 In 1956, Kripalu Maharaj organized another spiritual convention, this one in Kanpur, which was equally well-attended by major spiritual figures from across India, including Shri Raj Narain, Shat Shastree, the Chief Secretary of the Kashi Vidvat Parishad, one of the great and revered figures of the holy city of Varanasi. He was so taken with Shri Maharajji’s speaking and his unequalled grasp of scriptural wisdom that he invited Shri Maharajji to speak to the spiritual scholars of Kashi. The next year, 1957, Kripalu Maharaj journeyed to Kashi to give the discourse. The group to which he spoke at Kashi was attended by all major religious figures from Varanasi, and also others from all corners of India. In Kashi, his speeches to the scholars of Varanasi lasted for seven days. In these talks, he displayed a mastery of the Vedas, the Upanishads, Sutras, Upvedas, Darshan Shastras, Puranas Itias, the philosophies of the Jagadgurus, and the writings of the rasik saints, while at the same time radiating the humility and kindness of one wholly absorbed in Radha Bhao. It was at the close of these discourses that the esteemed scholars of the Kashi Vidvat Parishad took the opportunity to shower praise and offerings of flowers upon Shri Maharajji, and to offer thanks for having the opportunity to learn from his presence. In this way, he came to be recognized as the fifth original Jagadguru in the last 5,000 years. Only four other Jagadgurus had come before him: Jagadguru Nimbarkacharya (<600 BC); Jagadguru Shankarcharya (509-477 BC); Jagadguru Ramanujacharya (1017-1137 AD); Jagadguru Madhvacharya (13th century). Shri Maharjji has not created a new and seperate philosophy to express his views, but rather accepts the Shat Sandarbh of Jeev Goswami, and holds the Bhagwatan to be the complete and final scriptural authority. He has made a large contribution by working to reconcile differences between the Darsham Sutras and the philosophies expressed by prior Jagadgurus, and thus helped to eliminate any scritpural conflicts that might have lingered for hundreds of years. For Kripalu Maharaj, the soul’s desired aim is to receive the selfless and divine love of Radha Krishna. Another contribution he has made is to adapt Hindi as his chosen language of scholarly expression. Up until about 500 years ago, Sanskrit was the common language of scholars and also available to more people. Today very few people are familiar with Sanskrit, and so Shri Maharjji has done a great service by using the common language in his writings and making his insights much more widely available. His writings are: Prem Ras Siddhant (the philosophy of Divine love), Prem Ras Madira (the 1008 leela songs of Radha Krishna), Bhakti Shatak (the concise philosophy of the Upanishads, Gita, Brahm Sutra and the Bhagwanatam), Braj RasMadhuri (the chanting book), Radha Govind Geet (eleven thousand one hundred couplets of Radha Krishna leelas and the devotional philosophy), Yugal Shatak, Yugal Ras, Shri Krishna Dwadashi; and Shri Radha Traodashi.